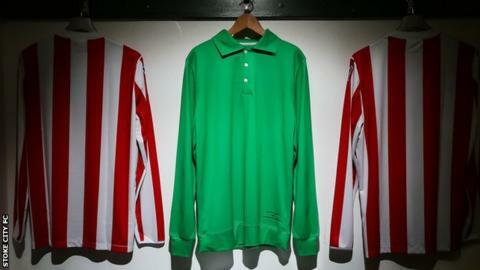 Stoke City's Jack Butland will wear a special plain green jersey as the club celebrate the life and career of their legendary ex-England goalkeeper Gordon Banks against Aston Villa on Saturday. World Cup-winner Banks died this month at the age of 81. Fellow England international Butland will wear the strip, which has no badge, sponsor or name. It recreates the one Banks wore as Stoke beat Chelsea in the 1972 League Cup final, their only major trophy. Banks won 73 England caps and was a vital part of the side that won the 1966 World Cup. He played for Stoke for six years from 1967. A club statement said the gesture for the Championship match - the first home game since Banks died - was a "fitting tribute". Kit sponsor Macron said it was an "honour" to be able to produce a shirt to help remember a "footballing great". The club will hold a minute's silence before kick-off, with members of the Banks family in attendance, as well as team-mates from Stoke's victorious 1972 League Cup winning side.